A gauge at Kaikoura, 181 km (112 miles) north of Christchurch, measured a wave of 2.5m (8ft 2ins), according to Weatherwatch.co.nz. Residents in the Chatham Islands, an archipelago 423 miles (680km) south-east of the mainland, were also being warned a wave would hit imminently. Others have taken to social media to offer people a safe bed for the night. 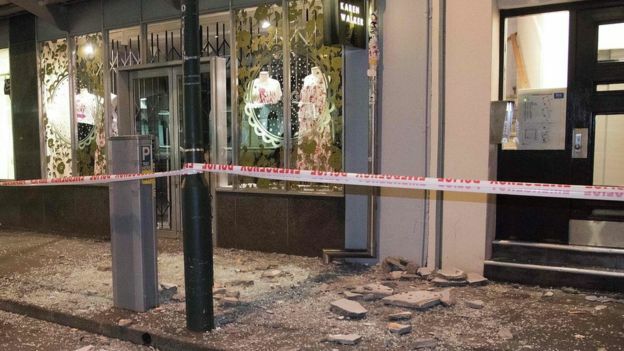 The Herald newspaper said the tremor was felt all the way to Wellington, where sirens sounded and people fled buildings into the streets, some of them crying. Early reports suggested some houses in Cheviot town, near the epicentre, have been damaged. But Chris Hill, a fire officer in Cheviot, said officials had gone door to door evacuating residents and found "everyone seems okay". 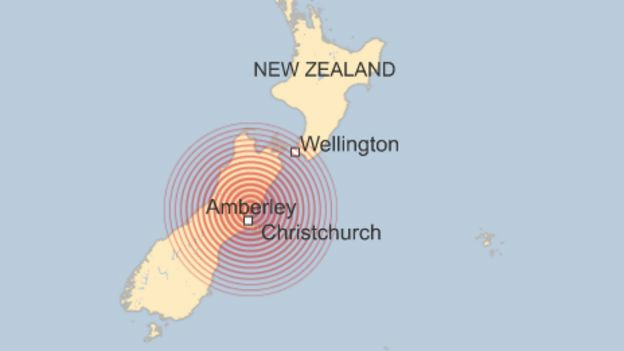 He told RadioNZ: "There's a lot of debris in houses, but at this stage it doesn't look like anything too bad has happened." 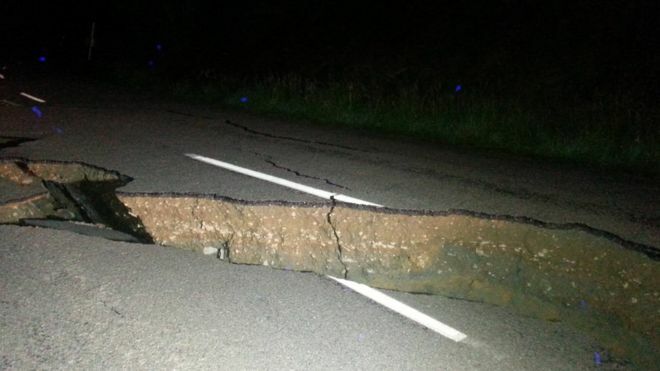 A resident of Christchurch said the tremor lasted a "long" time. "We were asleep and woken to the house shaking, it kept going and going and felt like it was going to build up," she told AFP news agency. 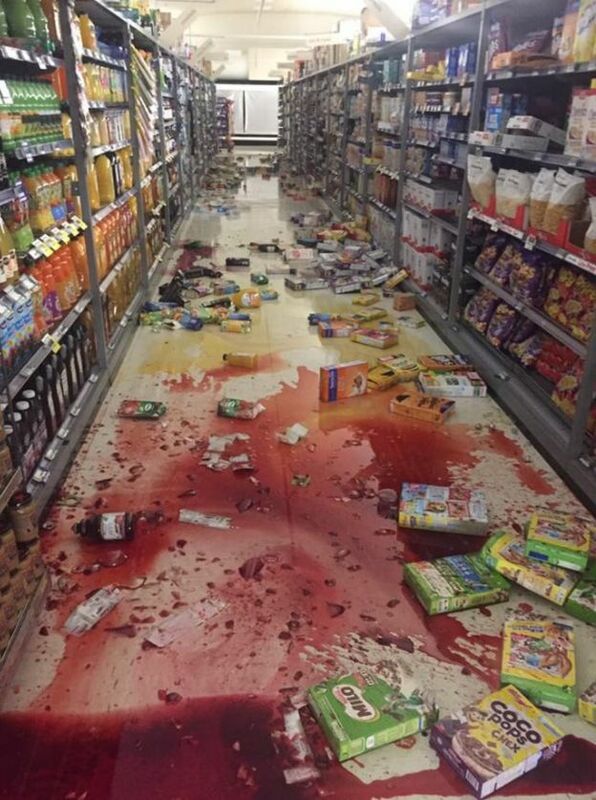 On Twitter, Hayley Colgan described it as "the the most terrifying earthquake I think I've felt in my 23 years in New Zealand". 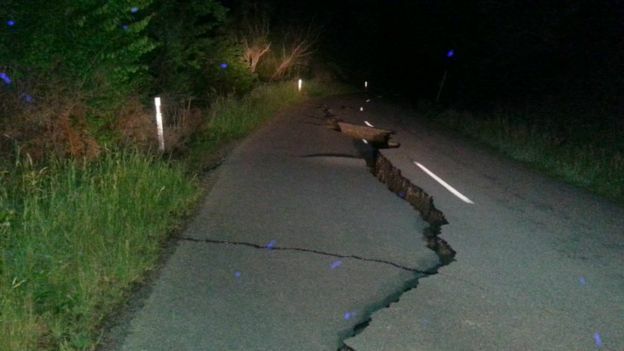 A magnitude-7.1 quake struck 169km (105 miles) north-east of Gisborne on the North Island in September, sparking a tsunami warning. It caused some damage to property, but no injuries. Still not a scratch on that Christchurch quake from just a few years ago..
(With a magnitude of 7.8 though, this latest 'quake could still be nearly a hundred times more intense than one that hit here, back in 1989 (The Newcastle Earthquake)..). As for the "tsunami" -- to get a really serious Tsunami, you would need either a massive underwater landslide/rockslide or a volcanic eruption several miles of the coast, as a result an earhquake. After one massive earthquake over there a few years back, there was a "Tsunami warning" for the East Coast of Australia..
Aerial photo taken and received on Monday shows debris causing a huge dam, north of Kaikoura on the South Island’s east coast. And warnings of aftershocks possible over the next couple of days.. The 2011 earthquake that killed over 180 people and virtually destroyed Christchurch's CBD was weaker (at 6.2, vs. 7.8 on Sunday..) -- the damage from this much stronger quake is much less >>> probably because this time 'round, the epicentre was further away, and deeper down (?). Cowabunga, how will they get them down? They said they were going to rescue them. I guess, by a helicopter and sling ro some such arrangement. Using a pick and shovel to dig a way out for them (a ramp ? ), while at the time any helicopters were probably still looking for/removing stranded people.. Someone who did shame himself, was the the boss of the NZ SPCA, who was talking of 'euthanising', and even claimed that their own rescue team might be the only solution -- and meanwhile, apparently, the farmers just get on with it, and fix the problem themselves.